Like the original Vapor® aircraft, the Night Vapor™model is slow enough and light enough to fly in a living room, a basement or even the conference room at work. To this amazing slow flight performance, it adds the fun of LED lights that allow you to fly in the dark. It also features a new modular design that makes replacement of broken parts quicker and easier. 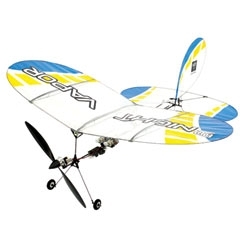 Best of all, you can have the Night Vapor RTF flying in as little time as it takes you to charge its battery.